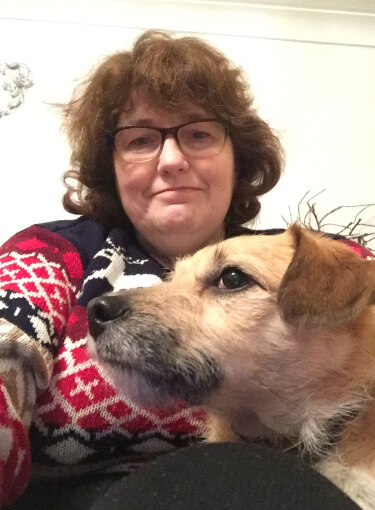 Sally, from Essex in the UK, recently signed up as a Be My Eyes volunteer. She’s new to the game, but also brings something new to the game: her perspective. Sally has Ehlers Danlos Syndrome. The condition affects her mobility meaning Sally uses a wheelchair or crutches to get around, she does not work and spends much of her time at home. It also means that she has a profound level of understanding that other volunteers don’t; it’s what fuels her participation with Be My Eyes. Sally was utterly amazed with the concept of Be My Eyes when she first caught word of it. She recalls that she was sitting with a friend of hers, who suddenly received a call on their Be My Eyes app. At that point in time Sally had never heard about the service and watched in fascination as her friend assist the blind user finding a dropped tablet. I have an iPhone, but I’ve never used it to its potential, really. And yet that seemed to be a fantastic idea that I could be handy for somebody else, and I could feel useful to somebody else all of a sudden. It’s always felt natural to Sally to reach out and help other people. Before she was diagnosed with Ehlers Danlos Syndrome, Sally was a nurse and later worked as a breastfeeding peer-supporter. But having a disability sometimes meant things felt out of reach for herself. Discovering Be My Eyes made her feel empowered; she has realized that she is able to help, and felt a newfound sense of purpose. Being able to help people is a massive part for me because it will give me a bit of the old me back, where I was able to help people. Although she has yet to take her first call, Sally is looking forward to having something new to talk about with the people in her life - what she calls a positive conversation starter. She is grateful to have a role in the community and an opportunity to connect and help another person because she feels like it’s giving back to the rest of the world. This is what makes the phone so worthwhile. Because to me, a phone was a phone, and now it’s not. It’s a tool. It’s a tool to help somebody else, and befriend other people, and be nice to other people, and give to the world. Be My Eyes is a tool for blind and low-vision people and a way to connect in order to find solutions. But Sally’s experience highlights just how the app can double as a tool for volunteers to feel empowered, purposeful and personally fulfilled.